Back in February, First Showing.net reported that Disney wants to release a new hand-drawn animated movie every two years. The Princess and the Frog is already out in theaters, with an 85% rating on Rotten Tomatoes, and is set to expand nationwide this weekend. But what’s next for Disney? We’ve heard rumblings of other projects in the works and, of course, the new Winnie the Pooh movie will be hand-drawn, but is there more? Brendon Connelly from SlashFilm got a small update on another new hand-drawn Disney project called The Snow Queen. It’s apparently an old project that fell apart a few years back and has been dusted off again recently. Brendon also learned that apparently Alan Menken, the musical mastermind behind The Little Mermaid and Beauty and the Beast, is working on the music for The Snow Queen. 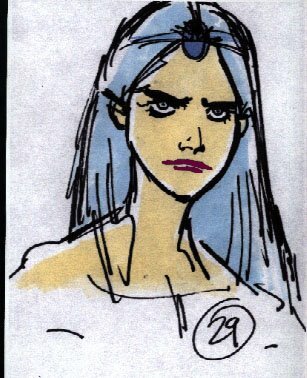 They also have a bit of concept art on the site of the new queen, who looks much more like a villain than a hero (but maybe that’s the twist in this story). The Snow Queen is a fairy tale by author Hans Christian Andersen that centers on the struggle between good and evil as experienced by a little boy and girl, Kai and Gerda. It looks like that’s what Disney will be adapting for this animated film, which will follow Winnie the Pooh (currently set for release in 2011). Some more hand drawn pictures can be found here. If you read the story you would know that the Queen in the villain. The protagonists are two little kids. The Snow Queen IS the villain in the original fairy tale. Loved this story when I was little, can’t wait to see more of this as the project develops.